During our class discussion on Capitalism, the idea was briefly mentioned that the term “indie” is being used as a marketing tool. Now indie games, I see as a relatively “new” phenomenon, only really coming into the public eye in the last 4-5 years or so. There was the “Indie Game Revolution” sponsored by Nintendo, PAX Prime had special areas during the convention that was entirely dedicated to indie games, and Nintendo hosted “Nindies” at a hotel nearby, where PAX guests could play indie games on Nintendo’s Wii U and 3DS systems. 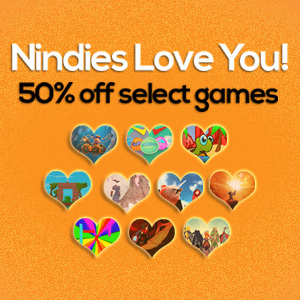 Steam even has a special category for “indie” games, and Nintendo has recently promoted sales of “Nindies” with special Valentines day discounts. This then begs the question. Is Steam, Nintendo, and other gaming companies using the term “indies” as a way to describe certain games and evoke a certain idea of “indie games” to consumers? Is it trying to define what makes an indie game a “indie game” and using a blanket term for a much more diverse genre of games? For most developers who want to publish their game on a distributing site like Steam, or launch it on Nintendo’s or Sony’s systems, there’s the issue of being approved by them, being green lit, and if it is one of the main ways to distribute an independent game to the majority of gamers, then wouldn’t it mean that these companies then have the say as to what makes a good “indie” game? Of course, there’s always the option of distributing it on a personal website, or making a web browser based game, but is it enough to be able to share the game with others? It seems like the notion of being green lit by Steam or approved by the other AAA companies is helping yet hurting the indie game developers. Yes, we’re moving forward in videogame diversity, but is the recent notion of “indie game” set by big companies pushing us back? Thoughts on this? Agree or disagree? 6 Comments on “Indie” as a Marketing Tool? 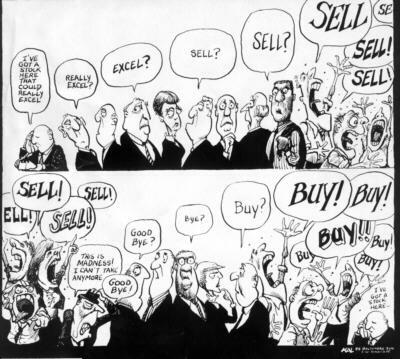 Great post – and a tricky topic worth pursuing further. I can relate that art students I teach who have gone through the process of getting a game on Steam find its a particularly demoralizing situation, one that can end up affecting the design process in a negative way. There is a fluid yet palpable set of qualities tied to a sense of ‘indie’ that circulates in these digital distribution systems, setting consumer expectations and (hence) potentially hindering experiments with non-traditional designs and themes. I think you’ve hit the nail on the head. It’s difficult to prescribe a definition to “indie” as the term is often applied to a breadth of games. Instead, it might be more useful to look at the feelings and associations the word evokes to understand what place it has in today’s game culture. To me indie is simply a label that connotes a distinction from mainstream games, typically through differences in production, themes, and goals. With this in mind, it’s easy to see how developers and companies of all sizes, whether initially or retroactively, can use this term to elicit certain impressions about the game and target certain audiences. I don’t know much about the process of publishing games on distribution platforms, but I think you bring up a good point. If, like you said, there are screening procedures, then it certainly muddles the integrity of the indie label. But I think this is another example of why it’s not particularly useful to discuss indie in relation to the substance of games. There certainly are AAA games that have expressive and moral value, just like how there are self-proclaimed indie games that follow the “best practices” of game design. At the end of the day, only through playing the game and critically reflecting can we really make assertions to the merit of games. Disagree, but only with Steam. As for other companies like SONY and Nintendo, I don’t know enough about them to make a statement on their business practices. Steam is owned by Valve Corporations and Valve does not decide what games to tag as “indie” or what games to screen for in order to muddle the “indie” label. This is my understanding on how the two works, so if there is any mistake that you guys see, please feel to correct me (but with sources please as I would be interested in reading them). In Steam, the categories of games are organized by what tags they have, and tagging is done by steam users and developers- not Valve. As a user, I can tag any games with any tags I want (except with profanities). If certain tags are frequently applied, in this case “indie”, then that is the tag the game will get. So if I search for games under the “indie” category, the games with the “indie” tag will be there. It is not selected by a committee from Valve. Developers can also tag their own games, but those tags can be surpassed if the majority of steam users disagree with them or has a better tag. So even if the developers disagree with the tag, the majority wins. For example, if I set the tag for Dear Ester as a “survival-horror” and most others agree with me, then that tag will show up under the “popular user-defined tags for this product” even if the developers disagree with the tag. 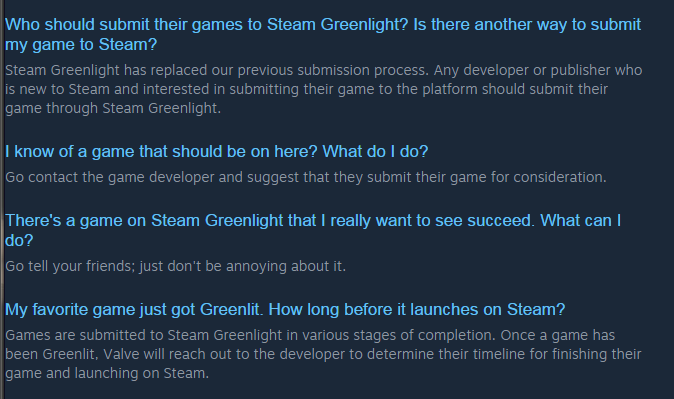 As for the Steam Greenlight, it is also decided by the steam users, not by Valve. First the developers pay a one-time $100 submission fee per Steam account, which according to them is to “keep spam and joke submissions out of the system”. And the fees are donated to Child’s Play, a charity organization for hospitals worldwide. After the payment, the developers can submit how many games as they want for free. Then, the votes come in. Not from Valve, but from other Steam users. Vote counts do not matter, but user interest do and it doesn’t have to be 1st or 2nd place in terms of votes. It just needs to show that people are interested in it. Any indie developers can post their games and if enough people show interest, then their game will be accessible via steam. So, no. In case of a big corporation like Valve, I do not believe that they are pushing us back by presented a certain game with an “indie” label. Their tagging and Greenlight is a step forward into diversification in my opinion. Any developers can post their games and as long as people show interest in it, it will be shared, sold, etc. Doesn’t matter what sexual orientation, race, age, etc you are or what idea the game represents, it will get Greenlit if enough people wants the game to be there. So even games like Hatred (2015), which is essentially Super Columbine Massacre RPG with better graphics and more levels (police station, hospital, suburban homes- kill everyone not just students), can be sold through Steam if it is Greenlit; this game hit #1 sales in steam when it came out too. Therefore, the tag “indie” is there not because Valve wants to evoke certain idea of “indie games” to consumers, they are there because the consumers want to evoke the certain idea of “indie games” to other consumers. – How good is the story? Will it grab my attention as I play the game? Some games are exception to this rule like FPS multiplayer Red Orchestra: Rising Storm (way better than Call of Duty or Battlefield multiplayer in my opinion). – Are the game mechanics well thought out? – Is this really worth the money I am shelling out for? Is it worth the time I’m spending? What is the return that I am going to get out of this? What experience am I going to get out of it? I usually watch let’s plays to determine most of them as they are a good estimate in my opinion. Again, the points I made so far are on Steam and its role in the “indie” labeling of games. Yes, thank you for the additional info, and my apologies for not properly looking into Steam’s game distribution practices. Though I do find it interesting that it is the majority of the Steam community that decides on the tags, and whether or not a game is Greenlit or not. It brings up an interesting discussion of what we can do to diversify the culture of games and the power of sheer numbers. @ Victor: Thanks for the deluge of helpful info! The issues were not with Steam directly, but Steam’s “culture” (which is, basically, a reflection of the desires of mainstream gamer culture – or at least the vocal aggregate). The idea that problems one might have with the system can be explained away or bracketed because “users decide” and the community is more or less in charge of characterizing games can only be sustained if we discount the role of & quality of the community that is enabled and nurtured there (on Steam). All this means is that IF one acknowledges a problem of diversity and experimentation along the lines Kopas and Schrank describe (in terms of design goals & techniques), you’ll have to improve that culture and its discourse, its ways of thinking, specifically in terms of openness and perceptions of value. Leaving it up to the community (a deliberate design by VALVe) means that the idea of what counts as a “game” or “polished” work worthy of purchase, etc. is subject to the existing hegemony. If popular game culture is A-OK for someone, and their desires are met, then Steam is sort of neutral to great. But if not, then the processes related to it, imposed by its dominance (not VALVe’s fault – indeed, that’s the goal of a digital hub business!) can be demoralizing. It’s why concentration of game cultural power into hubs like this can have an amplifying effect on the inherited values and ways of perceiving games, leading to a kind of monoculture, or at the very least inhibiting diversification or discoverability of games that just do not conform in visible ways to the popular regime. I’m still having trouble trying to see how Steam can have a mono-culture or limit diversification/discoverability. Can you provide an example? Here is why I am having trouble with what you said. Let’s say I am a trans-gendered person and I am searching for a game around that topic. I go to Steam and try to find one. I don’t know the title of the game as I am searching for a new game, and I don’t even know whether there is a category for it. Navigating sounds like too much work too… No problem. Google “transgender games” (it takes like 5 seconds). Find the name of the game, and use the search bar on Steam. Get game. No game? Suggest it on Greenlight if you want others to have it on Steam. Contact developers to put it on Steam if possibly and ask your friends to vote for it. Developers don’t want to put it on? Well, then it’s their choice. There is no hegemony, lack of diversity, or discoverability barring my decision to get this game or trying to search for this game. I do the same thing for popular games anyhow so it isn’t like I am putting more work into this. Is it the Steam community? The developers? The critics? The let’s players? The giant corporations? The government? Or even authors like Ian Bogost or Anna Anthropy? No matter what group you choose, you can always argue that that group is imposing some form of dominance over the others as to what game culture is or should be, that they are limiting diversity or discoverability of games and are creating this mono-culture. No matter how much you try to combat this “mono-culture”, there will always be that 0.1% that are demoralized by the “mono-culture” that they see. I try to avoid this can of worms altogether with a methodology of my own: let’s plays with no-commentary and estimating its value as an experience with its mechanics, details, cost etc. What needs to be emphasized are the roles of consumers as an individual who can think and argue for themselves. If individual consumers want to partake in the opportunities that are opening with a large online community, they have a responsibility of their own to uphold. Don’t agree with what the game you see represents or other the popular opinion about the game? Write a detailed commentary with evidence as to why you feel that way. You feel like something is amiss with the community or the corporation is limiting diversity? Research and present your findings with a falsifiable claim backed by evidence, and remember to site your sources. If someone other than you have a different opinion and wants to present their findings (a practice that is essential in empowering diversity in my opinion) then they can refute your claim with their own. To enable this process, it is paramount that we allow every to be able to pitch in (like Steam). In fact, this is exactly why I think Steam is anti-hegemony. There are so many genres of games and ideas that anyone can upload/download, discuss, and experience, it is really heard for one popular idea to inhibit another from doing what they want to do.